Injury to the brain areas concerned with vision can cause a variety of disorders ranging from visual field defects to much more complex deficits like visual agnosia. It all depends on the location and the extent of the damage. Injury to the occipital striate cortex results in corresponding homonymous visual field defects where typically all visual capacities are lost in the fields. 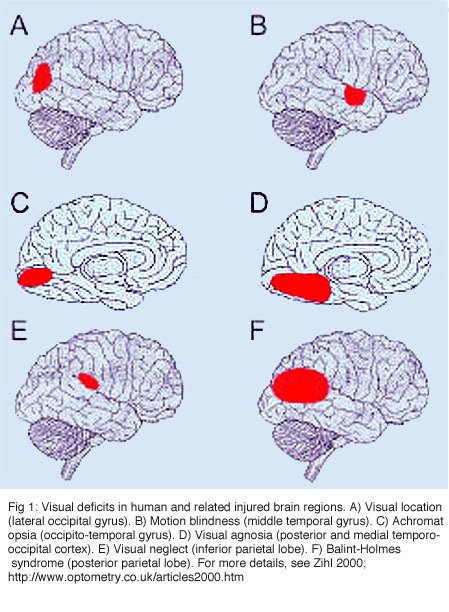 Injury to occipito-temporal structures can affect discrimination, selection and recognition of visual stimulus dimensions and, at higher stages of processing, of objects, faces, scenes, and letters (for review, see Zihl, 2000). Since the seventies, numerous investigations have focused on trying to restore lost function by replacement of injured brain structures with homologous allogeneic embryonic neural tissue. Such approaches have even reached the clinical level as a therapy for the treatment of some neurological disorders such as Parkinson’s and Huntington’s diseases. With the exception of these specific cases, though, we are not yet ready to go to the clinic. Intracerebral grafting presently remains an experimental model used to address fundamental questions concerning brain development, neuronal plasticity, regeneration and formation of topographic connections. The latter is a minimal requirement for functional recovery in point-to-point sensory systems such as the visual system (see previous chapter). Putting fetal brain tissue grafts in the mature central nervous system (CNS) differs from peripheral nerve (PN) grafting in at least the following two ways. Firstly, while a PN graft is used to bridge two brain areas, an intracerebral embryonic tissue graft is meant to restore the function of the damaged area. The fetal grafted tissue must develop its own set of connections with the right structures in the host brain, and these connections must be orderly arranged. Secondly, while all elements in PN grafting are at the same age, the intracerebral embryonic tissue graft is heterochronic with respect to the host tissue. For a short period post-implantation, grafted tissue behaves as an immature piece of brain. Theoretically, this immature status should allow circuitry reconstruction. Donor embryonic cells have a greater potential for axonal outgrowth and regeneration than mature host neurons (Chen et al., 1995; Shewan et al., 1995). Thus they may be better at establishing contacts with host target cells. Furthermore, the fetal graft may produce trophic factors or signaling cues, which are present in the brain only at early developmental stages, and should reactivate neurotropic processes in a ‘dormant’ host neuron populations. For instance, embryonic cortical transplants will produce NT-3 which is absent from the cortex past two weeks of age (Schoups et al., 1995; Friedman et al., 1998). In vitro assays (Castellani and Bolz, 1999) have shown that NT-3 has dual effects on layer 2-3 and layer 6 cortical neurons. Fifteen days after implant, cortical grafts will also produce a glial cell line-derived neurotrophic factor (GDNF), a potent survival factor for claustral neurons that project to the occipital cortex (Trupp et al., 1997; Matsuo et al., 2000). Unfortunately, there is abundant literature suggesting that environmental constraints from the mature host brain alter the restorative capacities of fetal grafts in various ways. Firstly, the mature environment affects both the number of surviving neurons within a graft and the size of the graft itself (Hallas et al., 1980; Gage et al., 1983; Crutcher, 1990; Collier et al., 1999). Secondly, the mature CNS environment is non-permissive for axonal regeneration of host neurons (Caroni and Schwab, 1988; Schwab and Caroni, 1988; Schwab, 1996, 2004; Spencer et al., 2003; see section 2 from the previous chapter). Thirdly, the mature CNS environment is poorly permissive for receiving outgrowing axons from embryonic allogeneic neurons (Walker and McAllister, 1987; Sofroniew et al., 1990; Cicirata et al., 1992; Grabowski et al., 1995; Sorensen et al., 1996; Armstrong et al., 2002). These above mentioned results suggest that intracerebral embryonic tissue grafts might only be effective in “diffuse” projection systems, i.e. by exerting a paracrine effect (Lescaudron and Stein, 1990; Bjorklund, 1991; Gage and Fisher, 1991; Stein and Glasier, 1995; Dunnett, 1999). In opposition to this, a few investigations have demonstrated that such grafts can restore, at least partially, complex motor behaviors (skilled forelimb reaching for food) that require a precise interaction between neuronal circuits, much more than expected of paracrine effects (Cicirata et al., 1992; Plumet et al., 1993; Riolobos et al., 2001). However, even in such reports, the donor neurons appear to establish a very limited number of connections with the host. Pioneer work in the visual system model was done in the mid-seventies by Drs Raymond Lund and Alan Harvey and colleagues, who transplanted parts of the embryonic CNS to various brain locations in neonatal rats (for a review see Lund, 1978). 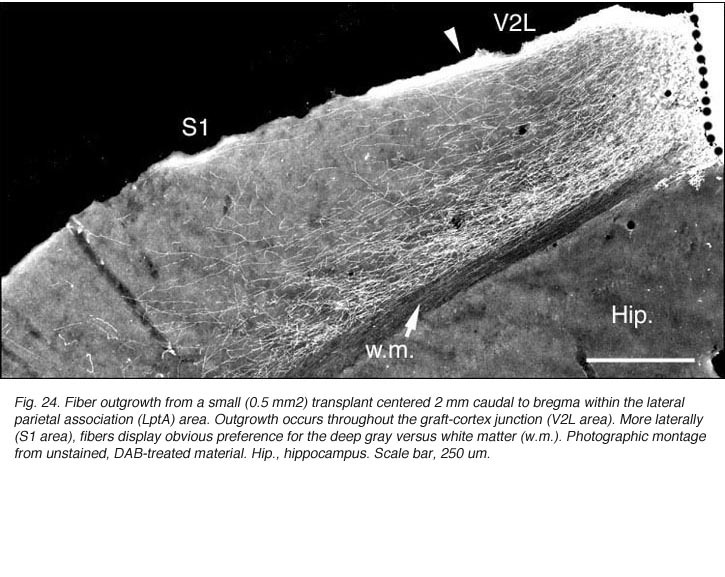 Most of their studies were focused on CNS development and, therefore, consisted of examining whether such grafts developed near-normal architecture, and established extensive connections with appropriate host structures. The outcome of fetal grafts into adult hosts has been studied less extensively, but a limited number of reports suggest that fetal tissues can integrate functionally within the adult host CNS. We will review these investigations that, in contrast to the mainstream opinion, show that tectal and cortical allografts can receive highly ordered inputs and can project to distant visual targets in the adult brain. Unless reconstruction of neural circuitries comparable to normal in terms of amount, extension and topical organization are achived, we cannot expect complete functional recovery in point-to-point neural systems. The normal structural and functional organization of the visual system of adult rodents has been investigated extensively and now forms a basis for regeneration experiments (for review see Sefton and Dreher, 1995; Zilles and Wree, 1995; Sefton et al., 2004). A brief summary of the major findings is given below for comparative purpose. In the adult rat, virtually all (> 95%) retinal ganglion cells (RGCs) project contralaterally to the superior colliculus (SC) and to the dorsal division of the lateral geniculate nucleus (DLG). In the SC, axons from the retina enter at the level of the stratum opticum (SO) and arborize in the SO and the superficial gray layer (SGL). Dense terminals are also found in lateral posterior nucleus, LP; ventral division of the lateral geniculate nucleus, magnocellular part, VLG; intergeniculate leaflet, IGL and pretectal nuclei (nucleus of the optic tract, OT; olivary pretectal nucleus, OPT; posterior pretectal nucleus, PPT). Some of these inputs (30-50%) are collateral branches of retinocollicular axons. A small contingent (< 5%) of the RGCs contacts the same structures ipsilaterally. Thus each retinorecipient center receives input from both eyes. Sparse projections are found in the suprachiasmatic nucleus (SCN), the various nuclei of the accessory optic system, the hypothalamus and the inferior colliculus. A schematic view of these connections is given in Figure 6 of the previous chapter. The DLG is much more than a relay center for RGC projections to the cortex. In fact, it receives most of its input from structures other than the retina, namely the visual thalamic reticular nucleus (Rt), layer 6 small pyramidal neurons in the occipital cortex (areas 17, 18, 18a; also called respectively areas Oc1, Oc2M, Oc2L; or areas V1, V2M, V2L), the SC (SGL layer), some pretectal nuclei (OT, OPT) and the contralateral parabigeminal nucleus (PBg), an homolog of the isthmo-optic nucleus in lower vertebrates. Projections arising from relay cells in the DLG are restricted to Rt (dorsal part) and occipital cortex. The retinorecipient layers of the SC have reciprocal connections with the VLG, the pretectum and the ipsilateral PBg nucleus (ventral and dorsal divisions). They receive further afferents from the contralateral PBg and from layer 5 pyramidal neurons in the visual cortex. Major efferents go to the DLG, the LP thalamic nucleus and to the intermediate (IGL) and deep (DpL) gray layers of the SC where other sensory systems are represented. The LP nucleus (equivalent of the LP-pulvinar in cats and of the pulvinar in primates) has reciprocal connections with visual (mainly Oc2L, layers 5 and 6) and temporal areas in the ipsilateral cortex. The LP receives additional inputs from the Rt, zona incerta (ZI), and the pretectum (OT). Neurons in the IGL and DpL layers of the SC project to various structures in the pons, brain stem, cervical spinal cord and hypothalamus. The VLG has reciprocal connections with the pretectum (OT, OPT and APT, the anterior pretectal nucleus), SC (SGL and SO layers) and its contralateral homolog. It receives further projection from the occipital cortex (layer 5 neurons) and projects to the ZI, central gray, pons and the suprachiasmatic nucleus (SCN). Finally, in addition to retinal and collicular inputs, the pretectum receives cortical afferents from the occipital cortex and projects to the LP, to the adjacent lateraldorsal (LD) thalamic nucleus (which has reciprocal connections with the occipital cortex) and to the pons (largely to the reticulotegmental nucleus. Afferents to cortical area Oc1 originate predominantly from the three thalamic relay nuclei DLG, LP and LD. Termination sites are localized in layers 4, lower 3, 6 and 1. Other thalamic sources are the posterior complex (Po), ventromedian (VM), centromedian (CM) and the ventrolateral (VL) nuclei. Projections from Po and VM terminate in layer 1; those from CM and VL in layers 1 and 6. Further afferents are provided by frontal (Fr2), temporal (Te1-2), retrosplenial (RSA/RSG), perirhinal (PRh) and adjacent visual areas in the ipsilateral cortex. With respect to this scheme, area Oc2M receives no afferent from Te2 and PRh but an additional input from orbital cortical areas (MO/VO/VLO) whereas area Oc2L receives no afferent from Te1 and PRh but an additional input from the hindlimb region (HL) in the sensorimotor cortex. Afferents from the claustrum (CL) are mostly distributed in the infragranular layers of Oc1 and/or Oc2M areas (Shameem et al., 1984; Carey and Neal, 1985). 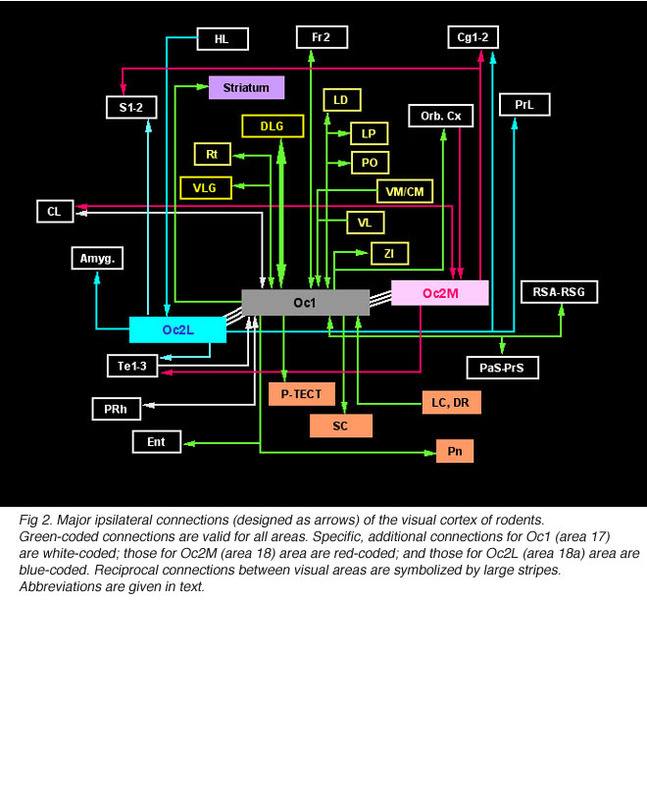 Oc1-2 areas also receive some callosal inputs from visual areas (layer 2-3 and 5-6 neurons) in the opposite cortex. Callosal terminations extend throughout the cortical depth at the borders of area Oc1 and adjacent extrastriate areas as well as in multiple patches through Oc2M-L areas. Prominent labeling also occurs in the infragranular layers of the temporal cortex. Finally, the visual cortex and subcortical retinorecipient nuclei both receive nonspecific cholinergic, noradrenergic and serotoninergic innervations from various structures in the basal forebrain, from locus coeruleus (LC) and from dorsal raphe nuclei (DR), respectively. Fig 2. Major ipsilateral connections (designed as arrows) of the visual cortex of rodents. Green-coded connections are valid for all areas. Specific, additional connections for Oc1 (17) are white-coded; those for Oc2M (18) area are red-coded; and those for Oc2L (18a) area are blue-coded. Reciprocal connections between visual areas are symbolized by large stripes. Abbreviations are given in text. In addition to reciprocal connections, visual cortical areas have widespread ipsilateral projections through the normal adult brain. At the cortical level, efferents from area Oc1 are found into the dorsomedial frontal area Fr2 (layers 1 and 6), the ventrolateral orbital area (VLO), the retrosplenial areas (layers 1 and 6), the perirhinal area (layer 5-6, up to the caudalmost pole of the cortex) and the entorhinal cortex. Additional efferents originating from area Oc2M are observed in the cingulate area Cg1, the parietal areas S1-2 (caudal part; layers 1-3 and 6), the temporal areas Te1-3 (layer 1-3 and 6, mainly) and the claustrum (full extent). Efferents from area Oc2L also target the dorsal half of the prelimbic cortex (PrL area) as well as lateral, basal and central amygdaloid nuclei (McDonald and Mascagni, 1996). 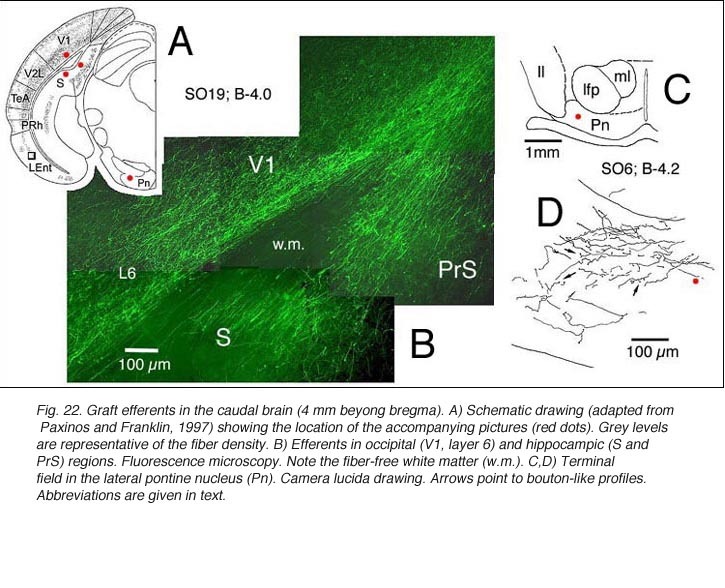 Projections from Oc2 areas to Fr2 and Cg1 extend up to the rostralmost pole of the cortex. At the subcortical level, Oc1 and Oc2 areas have dense terminals in hippocampal structures (presubiculum, PrS; and parasubiculum, PaS), striatum (the dorsomedial portion; Serizawa et al., 1994), visual thalamic nuclei (DLG, VLG, LP/LD, Po, Rt), ZI, various pretectal nuclei (P-TECT), SGL and IGL layers of the SC, and pontine nuclei (dorsolateral division; Wiesendanger and Wiesendanger, 1982). Contralateral projections are confined to Oc1-2 and Te1 areas as well as, but sparsely, to the dorsomedial sector of the striatum and the dorsolateral subdivision of the amygdala. Retinofugal axons arising in different retinal quadrants maintain their relative positions in the optic nerve, loose this initial order as they progress toward the chiasm, and reform a distinct dorsal-ventral arrangement in the optic tract before reaching primary visual targets where they terminate in a precise topographic manner (Baker and Jeffrey, 1989; Simon and O’Leary, 1991; Chan and Guillery, 1994; Chan and Chung, 1999). Retinotopy in visual centers was first seen by Lashley (1934a, b) and then abundantly documented by both electrophysiological and anatomical approaches (Simminoff et al., 1966; Montero et al., 1968; Lund et al., 1974; Drager, 1975; Wagor et al., 1980; Espinoza and Thomas, 1983; Olavarria and Montero, 1984). Recently, optical imaging technique have confirmed all previous findings(Schuett et al., 2002; Hubener, 2003). A schematic representation of the visual field topography onto the DLG, SC and visual cortex is given below (Fig 3). Fig 3. 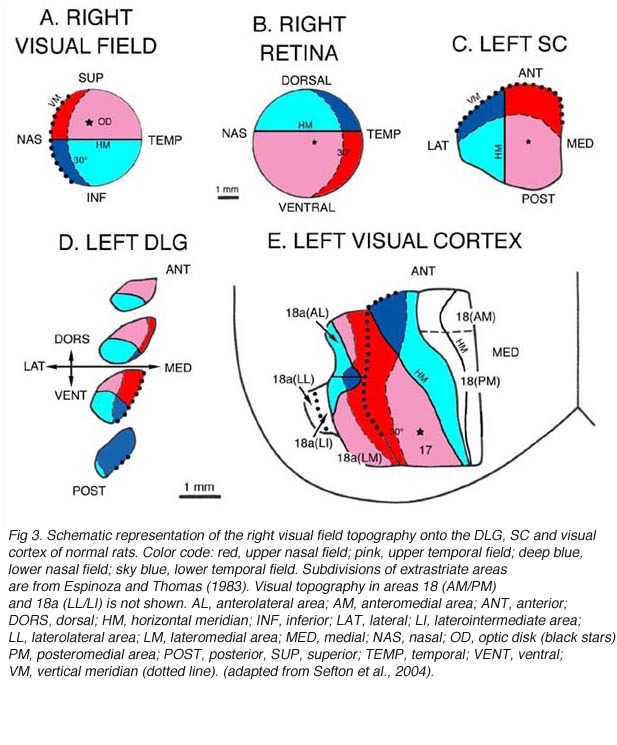 Schematic representation of the right visual field topography onto the DLG, SC and visual cortex of normal rats. Color code: red, upper nasal field; pink, upper temporal field; deep blue, lower nasal field; sky blue, lower temporal field. Subdivisions of extrastriate areas are from Espinoza and Thomas (1983). Visual topography in areas 18(AM/PM) and 18a(LL/LI) is not shown. AL, anterolateral area; AM, anteromedial area; ANT, anterior; DORS, dorsal; HM, horizontal meridian; INF, inferior; LAT, lateral; LI, laterointermediate area; LL, laterolateral area; LM, lateromedial area; MED, medial; NAS, nasal; OD, optic disk (black stars); PM, posteromedial area; POST, posterior, SUP, superior; TEMP, temporal; VENT, ventral; VM, vertical meridian (dotted line). (adapted from Sefton et al., 2004). At the geniculate level (Fig 3A,D), the nasal field (temporal retina) is represented caudally and dorsomedially; the temporal field (nasal retina) occupies most of the rostral part of the nucleus; the lower field (upper retina) is mostly represented in the caudal part of the nucleus, lateroventrally; and the upper field (lower retina) projects mainly to the rostral part of the nucleus, dorsally. The dorsomedial part of the DLG also receives input from the lower temporal quadrant (red sector; Fig 3B) of the ipsilateral retina. On the contralateral SC (Fig 3A,C), the nasal visual field is mapped rostrally; the temporal visual field, caudally; the upper field, medially; and the lower field, laterally. In rats, the representation of the central visual field is not substantially magnified. The ipsilateral retinal contingent projects anteromedially (red sector; Fig 3B). At the cortical level (area Oc1/17), the naso-temporal axis of the visual field projects from lateral to medial, the lower field (upper retina) projects rostrally, and the upper field projects caudally. A retricted caudal region of area Oc1 receives input from the ipsilateral retina. The vertical meridian (body axis) is set at the border between area 17 and area 18. Beyond this point, the naso-temporal direction is inverted. Borderline zones in areas 17 and 18 contain binocular neurons. Multiple ordered representations of the visual field are present in the adjacent extrastriate areas (for discussion, see Rosa and Krubitzer, 1999). Grafts usually consist of blocks or sheets of neural tissue excised from 15-16 day-old (E15-16) embryos, which are put into previously surgically-made cavities in the host. Older grafts survive poorly and have reduced size (Jaeger and Lund, 1980; Majda and Harvey, 1989). Though not critical for axonal sprouting (see below), delayed implantation has been assumed to enhance cell survival and outgrowth (Bjorklund and Stenevi, 1979; Sprick, 1991; Grabowski et al., 1994) probably because endogenous neurotrophic factors can accumulate at the lesion site (Nieto-Sampedro et al., 1982). Fig. 4. Basic transplantation protocols. A) For current anatomical studies. Blocs of embryonic tissue are implanted in aspirated lesion cavities performed in the host brain 3 days earlier. B) Used by Girman (1993) for electrophysiological recordings. Grafts are covered by a perforated plastic lid allowing multiple recording sessions of the same locus. Cx, host cortex; Oc1, rat visual area 17 (Paxinos and Watson, 1986). As in newborns (Harvey and Lund, 1984; Kurotani et al., 1993), primary connections with the host brain appear 3-4 days post-transplantation (Roger and Gaillard, 2004) whereas neovascularization and blood supply require approximately another week to be completed, a delay which may seriously hamper graft cell metabolism (Rosenstein, 1995a). Nonetheless, both graft implantation and development in adults can be as successful as in neonate recipients (McLoon and Lund, 1983; Harvey and Lund, 1984; Domballe et al. 2003). Investigations are usually performed 3-4 months post-grafting. In serial histological sections, all implants look like disorganized cellular masses that are more or less clearly separated from the host tissue by a region of lower cell density or host white matter. Glial scarring at the host-graft interface, although highly variable, is usually minimal (Bjorklund and Stenevi, 1984; Sprick, 1991). At this time point, graft development is achieved. Most neurons in cortical grafts (60-80%) seem mature (expression of Hu/Elav proteins; Domballe et al., 2003) and look ‘normal’ at the ultrastructural level (Albert and Das, 1984). The remaining neurons have immature characteristics such as multiple nucleoli or binuclear somas (Aleksandrova and Polezhaev, 1984; Sprick, 1991). Fig. 5. 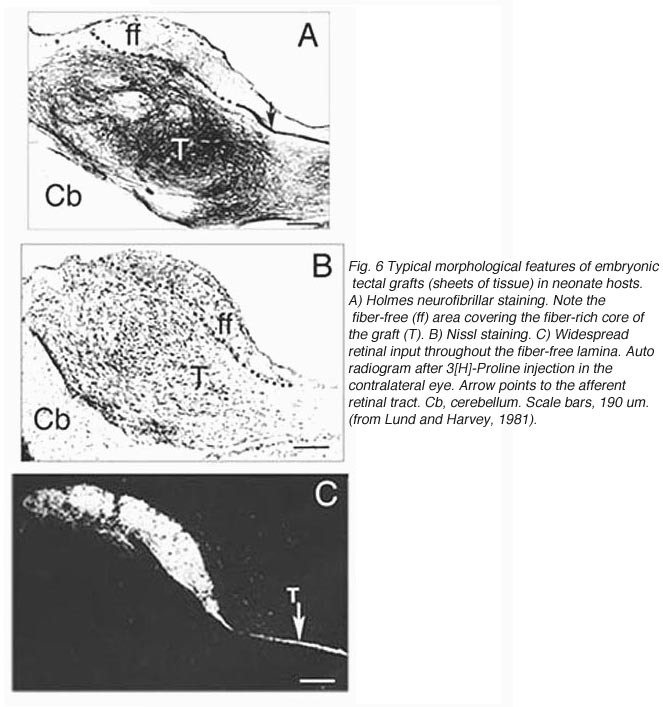 A-B) Typical cellular aspect of tectal (from Girman, 1993) and occipital (from Domballe et al., 2003) grafts 3 months post-grafting. Nissl staining. 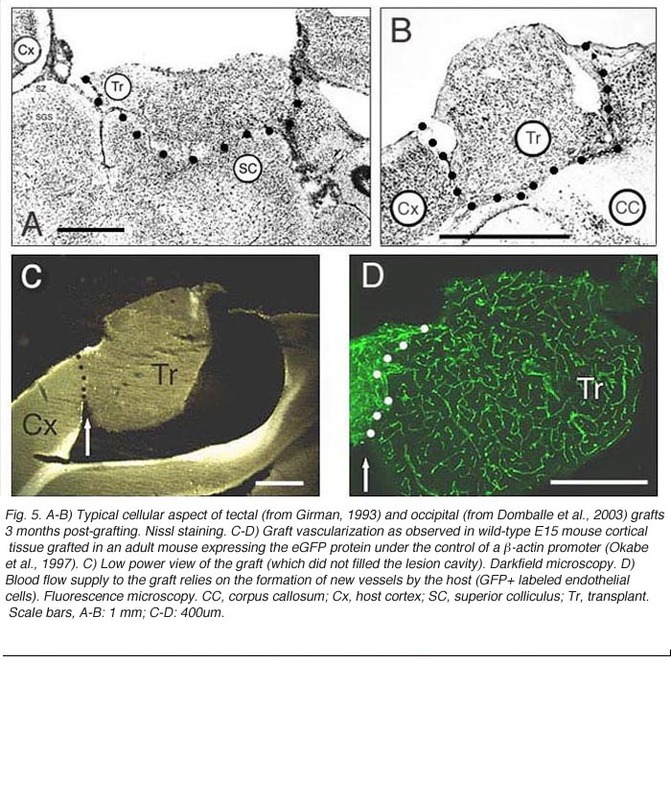 C-D) Graft vascularization as observed in wild-type E15 mouse cortical tissue grafted in an adult mouse expressing the eGFP protein under the control of a §-actin promoter (Okabe et al., 1997). C) Low power view of the graft (which did not filled the lesion cavity). Darkfield microscopy. D) Blood flow supply to the graft relies on the formation of new vessels by the host (GFP+ labeled endothelial cells). Fluorescence microscopy. CC, corpus callosum; Cx, host cortex; SC, superior colliculus; Tr, transplant. Scale bars, A-B: 1 mm; C-D: 400um. A typical feature of fetal tectal tissue transplants in adult hosts is the presence of dorsally located, myelinated “fiber-free” areas (Fig. 6). In addition there is a proponderance of cells with small perikarya and short dendrites (McLoon and Lund, 1983; Girman, 1993), a relatively high acetylcholinesterase (AChE) activity, a high concentration of alpha-bungarotoxin binding sites, and a low number of neuroglial elements (Harvey and MacDonald, 1985; Tan and Harvey, 1987; Harvey et al., 1987; Majda and Harvey, 1989). 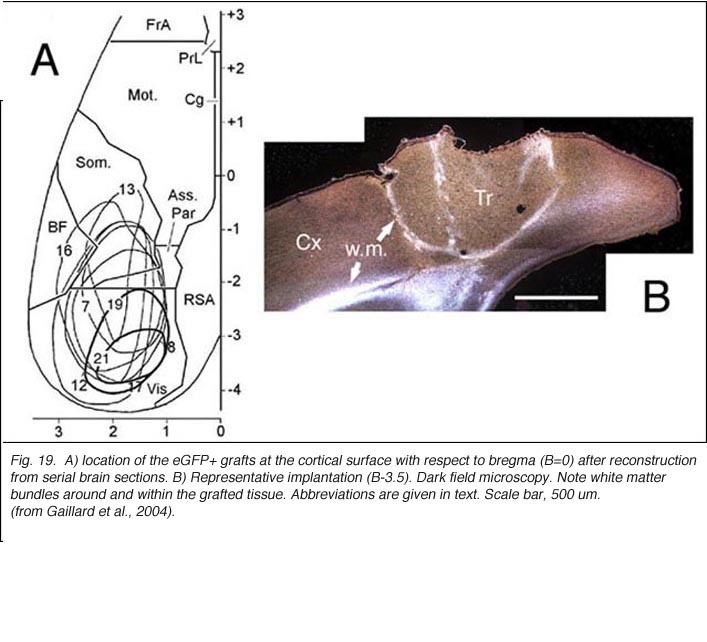 Similar characteristics are found in the retinorecipient layers of the SC in normal rats. In neonate hosts, “fiber-free” layer over the “fiber-rich” core of the graft (Fig 6), are penetrated by regenerated retinal afferents (Lund and Hauschka, 1976; Lund and Harvey, 1981). Grafts of blocks of fetal cortex lack the typical layered organization when integrating into the host CNS. Neurons are 80-60% of the normal density and gathered into clusters separated by myelinated bundles (Fig 7A-C). They also contain high number of neuroglial and microglial cells (Albert and Das, 1984). Regardless of their origin, cortical grafts typically receive diffuse cholinergic and aminergic input, mostly in their lower part, near the corpus callosum (Leong et al., 1991; Schulz et al., 1993, 1995; Domballe et al., 2003). Though roughly similar at a first glance, different cortical grafts show differences in their neuronal phenotypes. Based on Golgi-Cox stained material, Aleksandrova and Girman (1995) proposed a 3-group classification. Type I: grafts contain multiple neuron morphologies resembling those in the normal cortex. The small layer 2-3 pyramids have small or medium perikarya (10-16 and 20-26 um in diameter, respectively), and apical dendrites running for considerable distance along the graft boundary with unpredictable orientations. Type II: grafts contain a single class of multipolar neuron with oval or pyriform soma, a short apical dendrite and several thick processes. Soma sizes are typically large or hypertrophied, ranging between 16 and 50 um in diameter (Fig 7D). Finally, Type III: grafts have intermediate characteristics. In addition to the neuronal phenotypes found in the first group, one-third of the neurons have large somas (30-32 um in diameter). 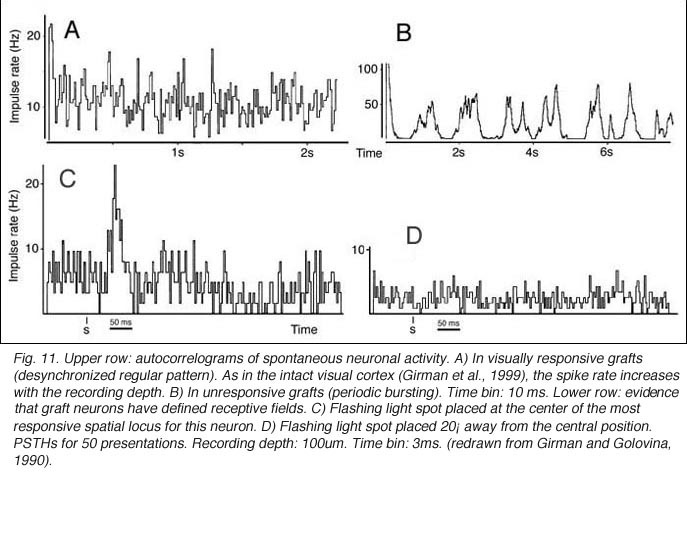 Interestingly, whereas type I and III graft neurons respond to visual stimuli (see below), type II graft neurons do not, displaying only highly synchronized burst-like spontaneous discharges (Fig 10). It remains to be clarified whether unresponsiveness is linked to abnormal neuron morphology or lack of input(s), or both (Girman, 1994). What we learned from the above-mentioned and other histological studies is that fetal tissue blocks grafted in a mature brain will never develop the specific architecture of the normal tissue they replace. They lack continuity with the host tissue, intrinsic laminar organization and neuronal arrangement in columns. Structural disorganization, however, does not prevent the formation of synapses able to excite grafted neurons (Albert and Das, 1984; Lubke et al., 1994; Bragin et al., 1988, 1989; Walsh et al., 1988; Wilson et al., 1990). 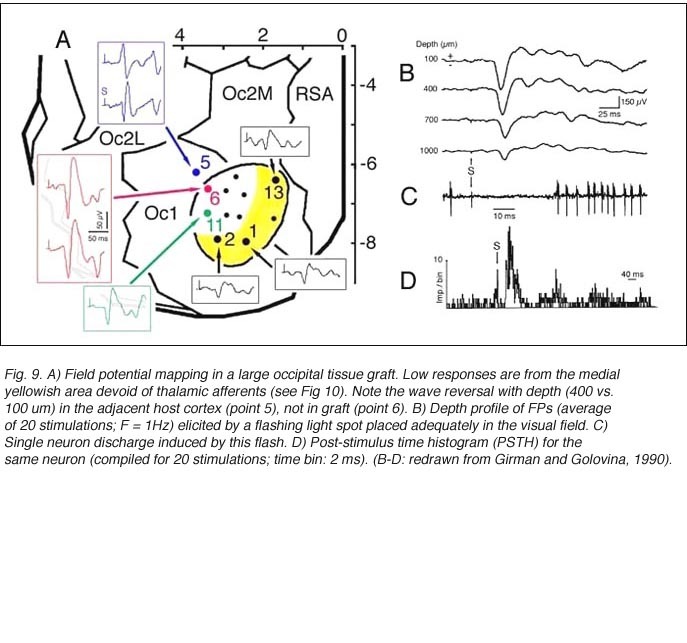 Girman and Golovina (1990) provided indisputable evidence that both transplanted tectal and cortical neurons can respond to visual stimuli presented to the adult host eye. 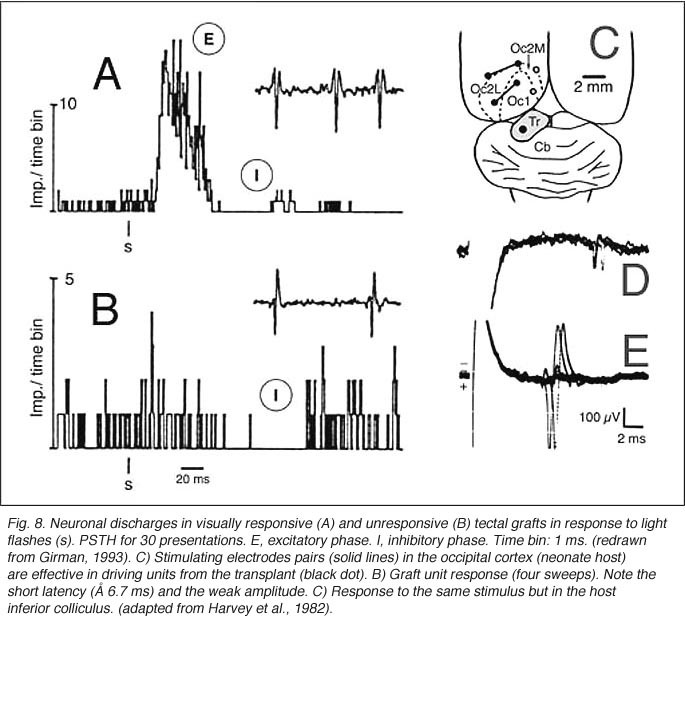 Girman (1993) reports good visual activity in about half of the tectal implants. Spontaneously active at rest, single-units respond to flashing light spots as well as to stationary and manually moved targets (5-16 degrees in diameter) with circular receptive fields (RFs). Best responses are obtained with small (3-5 degrees in diameter) black disks moved on a white background. Some units (29%) are direction selective. Response latencies to flashing spots (Fig 8) are in the normal range. Tactile and auditory stimuli are ineffectual. No visual response can be recorded in cortical tissue grafts placed at the tectal level. Both field potential (FP) and single unit recordings have been done in type I and III cortical grafts. FPs in grafts always consist of a negative-positive component. Wave onset and peak have normal latencies (Girman and Golovina, 1990; Gaillard et al. 1998, 2000; Domballe et al., 2003). However, it is interesting to note that none of the FPs undergo polarity reversal with depth, as occus in the normal rat primary visual cortex, Montero, 1973), and peak amplitudes correlate with the density of afferents (Fig 9, 10). Although recording field potentials is useful for delineating the graft outer limits and the most active zones within the graft for tracer injections, field potentials do not mean that these neurons can actually partake in any visual operation. 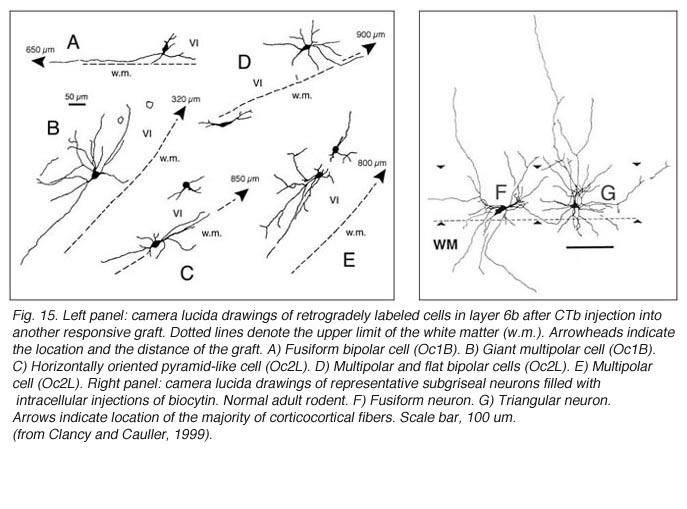 Girman and Golovina (1990), however, showed at the single-unit level, that many graft neurons did respond to visual stimuli. Approximately 84% of the spontaneously active neurons in type I grafts have well defined RFs (5-20 degrees in dia., Fig. 11) and exhibit clear responses for either moving or stationary stimuli. Cells preferring the same stimulus seem to be in clusters. Flashing light spots typically evoke a biphasic excitatory/inhibitory response of 36-62 ms latency followed by a second excitatory discharge. Movement-sensitive neurons fire weakly, or not at all, to light spots. Most of them show clear direction selectivity and orientation specificity. A few active neurons (16.5%) can be driven by stimulation of either eye; the contralateral stimulation being dominant. Visually driven neurons are less frequently encountered in type III grafts. These neurons have larger RFs (20-30 degrees) and react only to light spots after a long delay (100-250 ms). Finally, graft neurons also fire in response to electrical stimulation (10-50 uA) of either the host ipsilateral DLG nucleus or the contralateral visual cortex. An important finding, suggestive of some form of topographic organization between the DLG and the cortical graft, is that small displacements (200 um) of the stimulating electrode from the optimal geniculate site lead to a decrease or a complete loss of response. To a degree, they are. 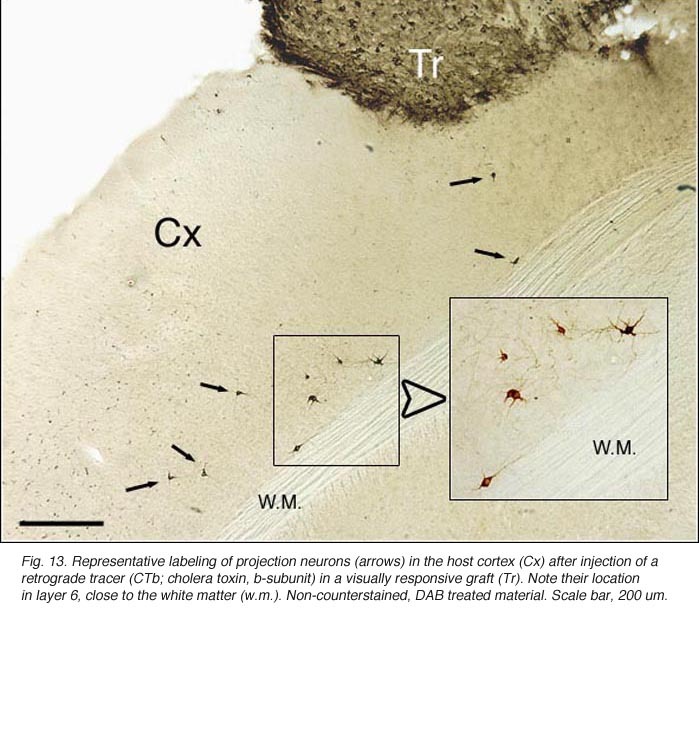 The same studies by Girman and Golovina indicate that large (3 mm in dia. 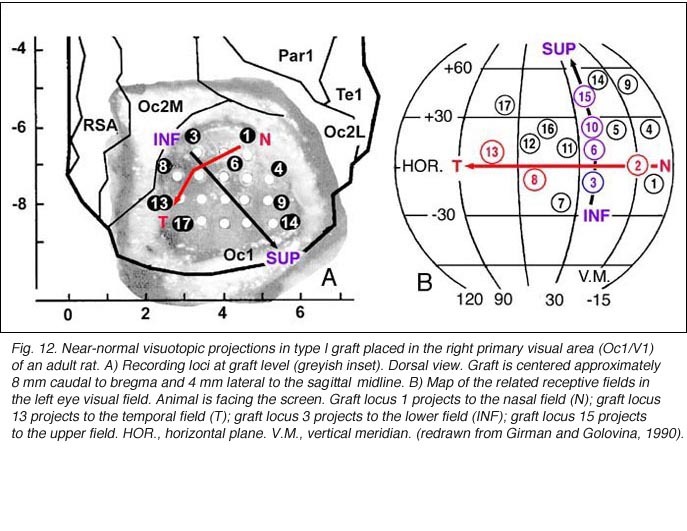 ), highly responsive cortical grafts contain an ordered representation of the contralateral visual field, at least of its central part which projects normally onto area 17. First, neurons recorded simultaneously at a given electrode position have roughly the same RF location. Second, there is no change in RF position with depth during a single penetration. Third, ordered changes in the recording positions on the graft surface induce concomitant changes in the RF locations. Fourth, the orientation of the visual field projection onto the graft appears normal relative to the skull landmarks (Fig 12). A rough retinotopic order is also observed in large type III grafts. The larger the grafts, the better the visual field projection: small grafts contain only a non-ordered representation of a restricted part (20-30 degree wide) of the nasal visual field. Visual map order and neuron properties remain unchanged up to at least 10 months post-grafting. This is a logical result in view of the fact that long-term survival (2 years in situ) does not significantly affect the basic morphological features of cortical grafts (Russell et al., 1990). 5. Do grafts receive extensive afferents? By this point, it seems evident that under some highly controlled and replicable experimental conditions, allogeneic fetal tissue grafts implanted at homotopic positions in the visual brain can respond to visual stimulation of the host eye. Some cells from the graft perform rather complex operation of visual driven signals – just like the SC and area 17 in the normal rat (Wiesenfeld and Kornel, 1975; Fukuda and Iwama, 1978; Burne et al., 1984; Girman et al., 1999). The graft can resume at least a partial, ordered map of the visual field, a prerequisite for recovery of function. However, topographic visual field representation on a graft is likely to involve many more regenerated host afferents than the few, randomly branching, fibers reportedly able to generate light flash responses in the PN graft paradigm (Keirstead et al., 1989; Sauve et al., 1995; Thanos et al., 1997). Direction selectivity, orientation specificity and binocular activation imply sophisticated synaptic input to graft neurons (Hubel and Wiesel, 1962). The next question then is whether homologous fetal grafts in the adult primary visual cortex receive extensive input from appropriate brain areas. Tectal tissue grafts implanted in juvenile (P15/P18) and adult hosts with the same technical approach also display discrete “fiber-free” patches dispersed dorsally within the fiber-rich core. However, no definitive projections from the host brain have been identified (McLoon and Lund, 1983), and retinal innervation to the patches remains a matter of debate (McLoon and Lund, 1983; Harvey, 1984; Harvey et al., 1987; Harvey and Tan, 1992). In short, there is yet very little anatomical evidence for the visual responsiveness recorded in tectal grafts. As suggested earlier by Golden et al (1989), a possible reason for this discrepancy may be the grafting technique. While grafts done by Golden et al. (1989) consist of partly dissociated cells injected onto the surface of the SC, the transplants done by Girman consist of “solid sheets of embryonic tectal tissue laid in the appropriate dorsoventral orientation over the SC surface devoid of superficial laminae”. In neonates, a similar paradigm as used by Girman leads to the formation of a single, densely innervated retinorecipient lamina covering a large part of the graft surface (Fig 6) (Lund and Harvey, 1981). Up to now, neither the connectivity nor the neurofibrillar structure of such tectal implants in adult hosts have been studied. Host afferents to cortical grafts. As the electrophysiological data suggest, there should be a strong relationship between graft responsiveness and the presence of regenerating axons (or collateral sprouts) from ipsilateral DLG neurons. 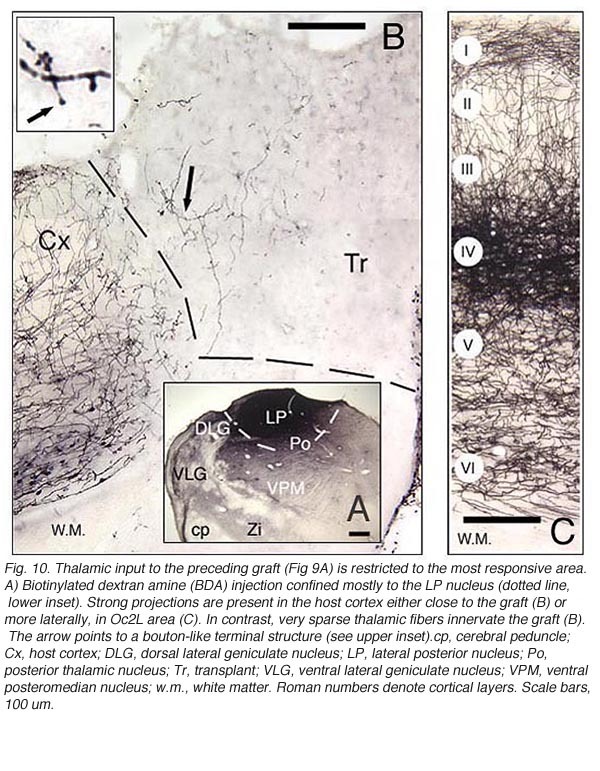 Indeed, retrograde tracers injected in type I grafts label high numbers of DLG neurons (one-third of which projected initially to the lesioned cortical site), whereas similar injections in type II grafts produce no labeling at all (Girman, 1994). Whether direct DLG input alone can account for graft visual responsiveness is, however, very unlikely since some type I grafts receive only extra-geniculate, and no direct geniculate inputs. Major graft input originates in host layer 5-6. After retrograde tracer (CTB: cholera toxin, b subunit) injection into type I-III grafts,Gaillard and colleagues (Gaillard et al., 1998, 2000; Domballe et al., 2003) saw a diversity of afferents. These afferents (always in very low number; Fig 17) appear in visual-related brain structures ipsilateral to the graft. The densest labeling (55-90%) is observed in the isocortex, mostly in the occipital areas surrounding the graft (see also Galick et al., 1991; Schulz et al., 1993). Together, neurons in claustrum, periallocortical areas and various non-visual subcortical nuclei account for some 20% of the graft input. 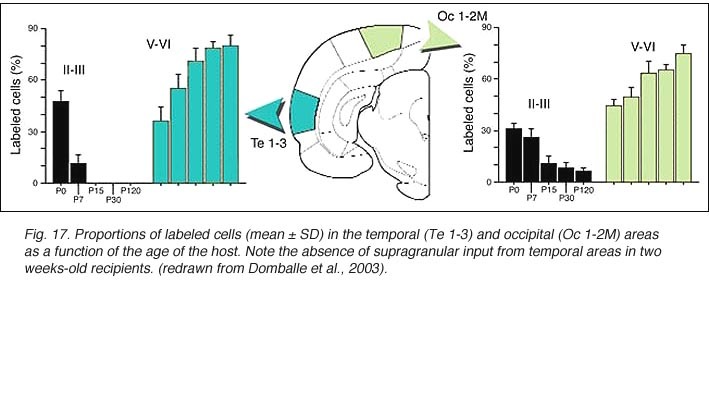 As expected, labeling in dorsal thalamus is highly variable. While practically absent in half of the subjects, it represents 10-30% of all the graft afferents in the other half. DLG input never exceeds 10% of the total graft input. Orbital (VO/VLO), motor (Fr2) and brainstem structures (such as basal nucleus of Meynert, locus coeruleus and dorsal raphe), all projecting to the normal visual cortex (Fig 2), are never labeled (Zilles and Wree, 1995). Labeling in the hemisphere opposite to the graft is always negligible. Apart from the isocortical area, most labeled neurons (91%) are confined to the infragranular layers (Fig 13, 14), noticeably layer 6 and sublayer 6b, close to the white matter. 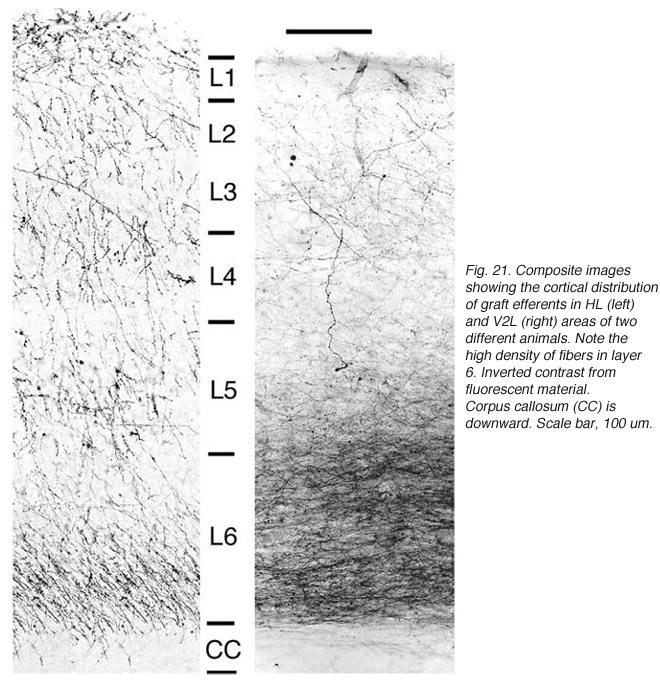 Layer 6b neurons in normal adult rodents exhibit diverse cell body morphologies (Fig 14, 15) and have widespread terminal arborizations (> 3-4 mm) in superficial cortical layers (Clancy and Cauller, 1999). They appear to be remnants of subplate neurons (Marin-Padilla, 1978; Reep and Goodwin, 1988; Valverde et al., 1989) which have pivotal functions during early cortical development, for instance in guiding thalamic fibers to their appropriate cortical target area (Chun and Shatz, 1988; Bayer and Altman, 1990; Ghosh et al., 1990) and in governing the functional maturation of connections between DLG axons and layer 4 neurons (Kanold et al., 2003), They are also involved in coordinating ocular dominance column formation (Lein et al., 1999; Grossberg and Seitz, 2003). 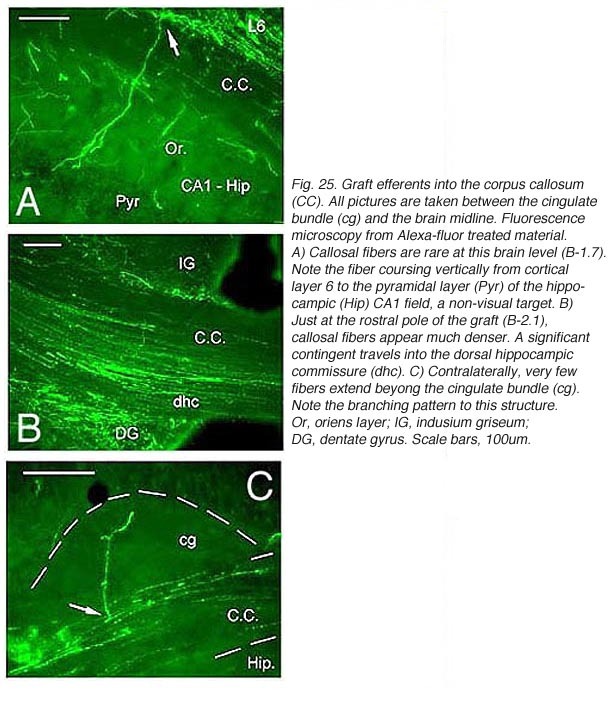 In the adult cat, subplate (white matter) and pyramidal cells of the normal and inverted types in the infragranular cortical layers, support long-range tangential connections (Galuske and Singer, 1996). When performed in neonate hosts, the same experiments always lead to greater density and diversity of graft inputs (Chang et al., 1984; Gaillard et al., 2000). At the cortical level, for instance, frontal (Fr2; the frontal eye field in primates) and orbital (LO/VLO) areas are moderately but systematically labeled; and the somas of the isocortical afferents distribute about equally between layers 2-3 and 5-6. At the thalamic level, owing to the severe (75%) atrophy of the DLG (Cunningham et al., 1979; Frappe et al., 1999), most inputs originate in the LP/LD complex and the central intralaminar nuclei, an unlabeled cell group in adult hosts. 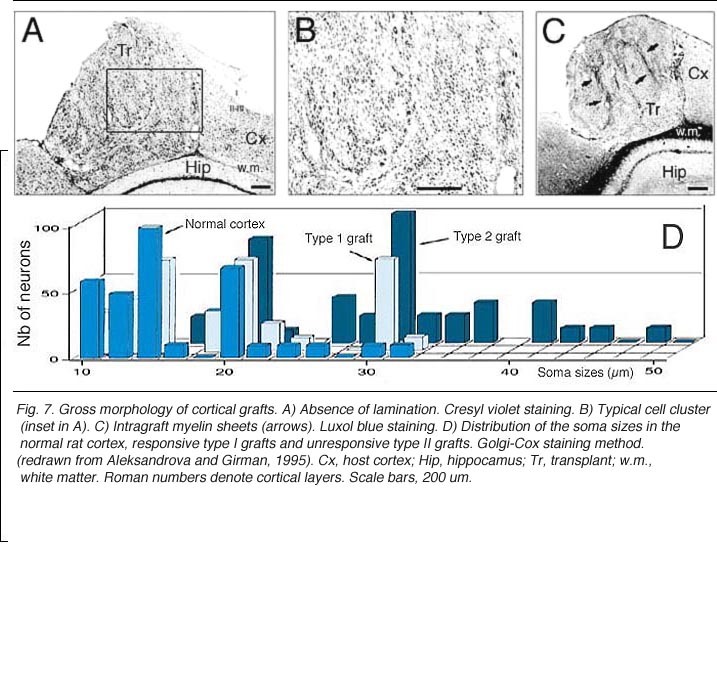 We conclude that the age of the recipient appears to affect both the density and the topology of the graft afferents (for similar data with parietal grafts, see: Castro et al., 1989; Schulz et al., 1993). Additional studies show, moreover, that the most dramatic changes in the afferent pattern occur in the second postnatal week, before the onset of the critical period for rat visual cortex (Fagiolini et al., 1994). 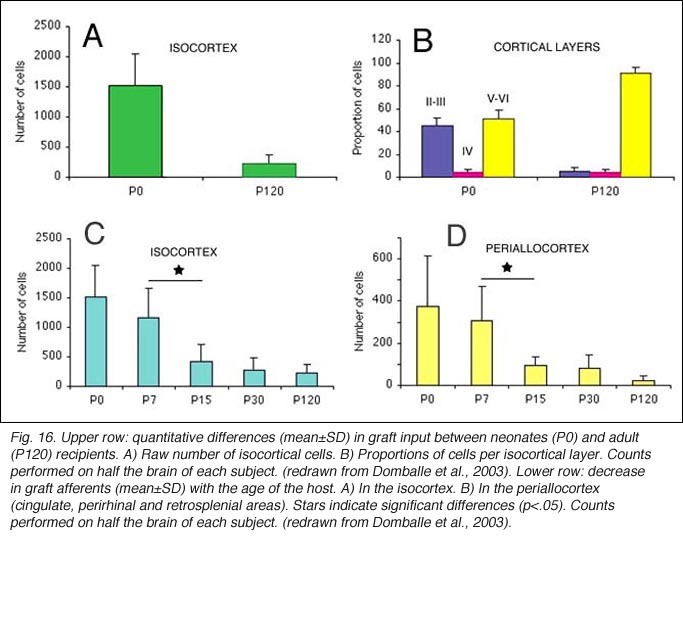 Nearly all isocortical inputs to the graft in P15 hosts originate in the infragranular layers, mostly from layer 6; a proportion not significantly different from that found in older recipients (Domballe et al., 2003). This age-related laminar shaping is a two-step process which affects all layers, but the supragranular layers more specifically. It is completed in frontal and temporal areas about one week earlier than in the occipital areas surrounding the graft (Fig 17). The delay is likely related to the cortical ontogenetic program which proceeds radially (Rakic, 1974) as well as tangentially through rostrocaudal and lateromedial directions (Luskin and Shatz, 1985; Ignacio et al. 1995). The potential of layer 6 neurons to survive injury and to drive grafts. 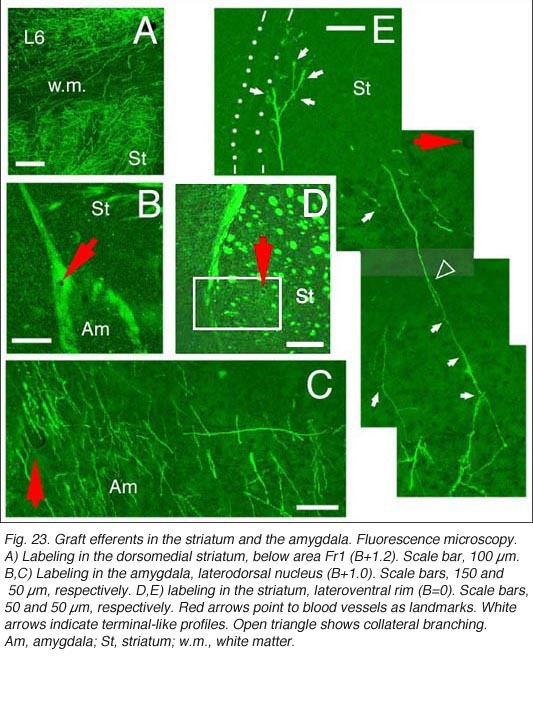 A major outcome of all the above mentioned studies is that afferent innervation to a cortical graft in adult host originates mostly from a small population of layer 6 neurons located in the immediate graft surround. Cortical layer 6 is a target for thalamic fibers. The layer 6 neurons display all known visual response types (Wiesenfeld and Kornel, 1975; Girman et al., 1999) regardless of their morphology. Of the four layer 6 cells injected with HRP by Parnavelas et al. (1983), one multipolar cell was an “on-off” cell, two pyramidal cells were “complex” cells, and the last fusiform cell type was a “non-oriented” cell. In the absence of direct thalamic input, layer 6 neurons may thus be able to drive visual information to the graft. Why layer 2-3 neurons do not contact the graft in adults is not understood. Among many possibilities, one would be that these late generated (E17-E20) corticocortical projection neurons, which have low survival rates during development (Miller, 1995), are very sensitive to lesion-induced retrograde degeneration and/or deleterious changes in their environment (but see Szele et al., 1995). Conversely, these neurons may be able to regenerate axons, but these axons do not penetrate the graft due to negative influences from reactive astroglial elements and/or graft neurons. For instance, in vitro assays (Castellani and Bolz, 1999) have shown that endogenous levels of neurotrophin-3 (NT-3) reduce axonal branching and repel layer 2-3 neurons, but have opposite effects on layer 6 neurons. For some days after implantation, the graft (which is producing NT-3) may thus be repulsive to layer 2-3 axons, but attractive to layer 6/6b neurons which express NT-3 receptors (Ringstedt et al., 1993). Regardless of how fascinating these latter observations are, multiple survival and growth promoting factors produced by the graft and the injured cortex may also allow layer 6 neuron survival and axonal elongation. For instance, NT-4 (neurotrophin-4) is as effective as NT-3 in increasing the length of the dendritic processes of layer 6 pyramidal cells of juvenile ferrets (McAllister et al., 1995). Furthermore layer 6b neurons have receptors to basic fibroblast growth factor (FGF-2), a critical survival substrate for subplate neurons (Cooke et al., 1999). FGF-2 is suspected to protect adult layer 6b neurons from death after lesions (Gomez-Pinilla and Cotman, 1992), but has no survival effect on one week-old layer 2-3 callosal projection neurons (Catapano et al., 2001). Deciphering why some layer 6 neurons in the adult brain have the potential for elongating their axons, and whether these neurons have excitatory phenotypes will be an interesting challenge, especially in the context of these cells consistently labeling regardless of the grafting strategy (Schulz et al., 1993; Barbe and Levitt, 1995). 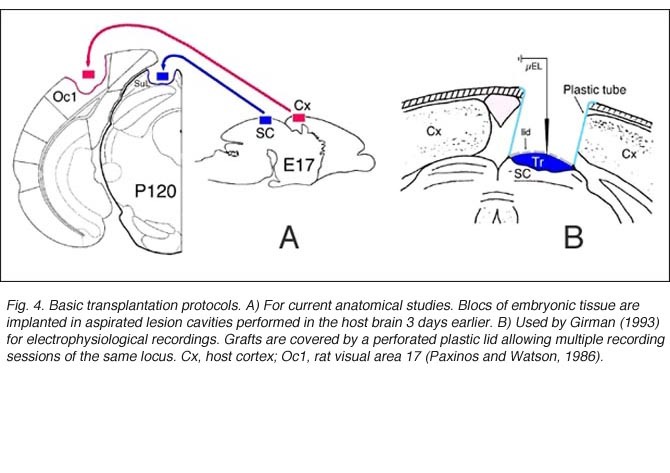 Mapping studies suggest that host afferents are topically organized in large tectal and cortical E15-17 embryonic tissue grafts. These results need anatomical confirmation, however. Beside occasional statements (Castro et al., 1989), this issue has only been specifically addressed in a single study using neonate recipients. The triple labeling approach by Worthington and Harvey (1990) shows that tectal tissue grafts receive non topographically organized, but nevertheless non-random, rudimentary ordered cortical inputs. 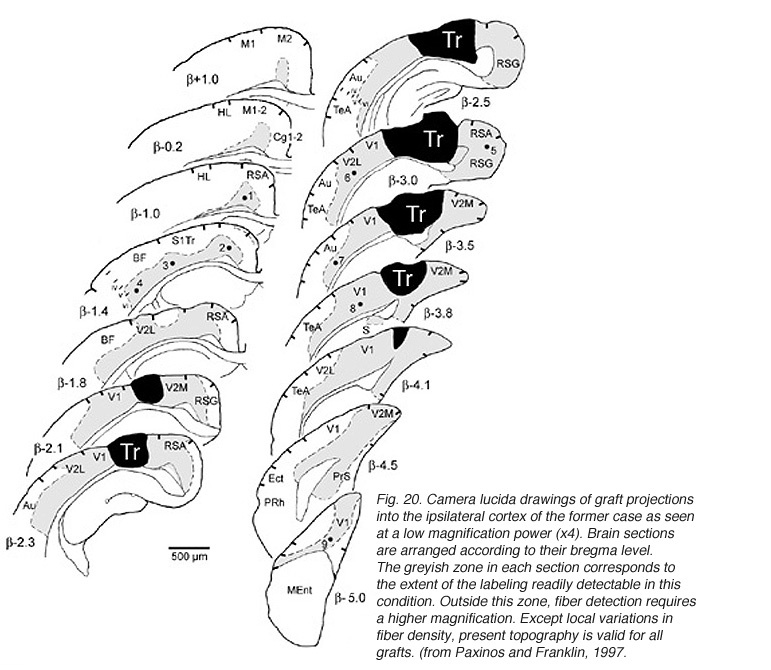 To date, no such investigation has been carried out with adult hosts, likely because one can hardly imagine how the discrete afferent projections reviewed above may form a coherent visual map onto grafts (see section 2.7.3 from the previous chapter). This negative reasoning does not consider, first that map formation may require a specific, highly controlled transplantation procedure (Worthington and Harvey, 1990; Girman, 1993) including possibly the correct orientation of the graft in the lesion cavity (Andres and Van der Loos, 1985; Kawaguchi et al., 1994), second that labeled graft afferents may reflect only a negligible proportion of the actual projecting host neurons, and third that single-unit recordings with carefully engineered microelectrodes (Levick, 1972) may be more powerful than tracer injections to detect small point-to-point shifts in connectivity between restricted brain areas. Meticulous surgical preparation, ingenious recording conditions and utilization of self-made highly specific tungsten in glass electrodes of the Levick’s type, may together account for Girman’s successful recordings (see Girman et al., 1999). In our opinion, unequivocal assessment of topographic host-graft projections requires further studies combining an optimal surgical strategy, a highly sensitive fiber detection process (see below) and a careful electrophysiological approach replicating Girman’s approach. 6. Can grafts send afferents to host targets? In line with numerous results showing low numbers of afferents coming to the transplant, it has been repeatedly assumed that allogeneic embryonic tissue grafts do not send long-range projections to the adult host. Our own attempts using either biotinylated dextran amine (BDA) or the carbocyanine dye DiI (1,1′-didodecyl-3,3,3′,3′-tetramethyl-indocarbocyanine perchlorate) as anterograde tracers confirm this assumption. This failure is commonly attributed to growth inhibitory conditions present in the mature brain (Schwab, 1996; Fournier and Strittmatter, 2001). Possible technical limitations are rarely addressed (Vercelli et al., 2000; Wu et al., 2003; Senatorov et al., 1993; Nelms et al., 2002). Yet, there are some intriguing morpho-functional observations (Walsh et al., 1988; Lubke et al., 1994; Rutherford et al., 1987; Rosenstein, 1993; 1995b; Triarhou et al., 1990; Woodhams et al., 1989; Xu et al., 1991, 1992) suggesting that blocks of embryonic neurons grafted into the mature brain might not be able to transport exogenously provided tracers beyond the graft-host transition zone. In opposition to this, long axonal trajectories have been clearly detected in some experimental conditions, either after pre-loading dissociated donor cells with dyes (Stoppinni et al., 1989; Hernit-Grant and Macklis, 1996) or by targeting specific markers expressed by grafted cells (Thy-1.2 allelic system; microtubule associated protein MAP1x/1B) (Zhou et al., 1985, 1989; Fujii, 1991, 1994; Brook et al.,1993). This has been a routine procedure for xenogeneic tissue grafts (see for example: Lund et al., 1985; Li and Raisman, 1993; Davies et al., 1994; Isacson and Deacon, 1996; Armstrong et al., 2002). A plausible hypothesis is then, that all fetal graft neurons, regardless of their origin, are intrinsically capable of elongating processes when placed in a mature brain, but that detection of these processes outside the graft structure requires a non-invasive anatomical approach. 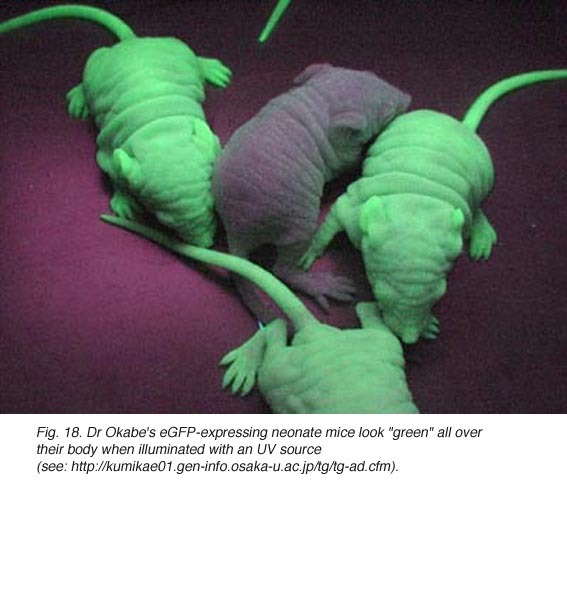 This hypothesis has been verified recently in occipital cortex tissue grafts (Gaillard et al., 2004) using transgenic E15 mouse fetuses expressing a GFP protein variant under the control of a chicken beta-actin promoter (Okabe et al., 1997) as donors (Figs. 18 and 19). Embryonic cortical tissue allografts have massive efferents. A major finding of the above study is that despite immediate implantation nearly all grafts into mature (P60/P90) wild-type mice appear physically well integrated in the host cortex (Fig 19). Moreover, they show massive outgrowth all along their interface with the cortical parenchyma and send extensive efferents throughout the host ipsilateral pallium, mainly to its cortical mantle (Fig 20). Rostrally, graft fibers innervate a large medial sector of the brain including frontal association (FrA), secondary motor (M2), prelimbic (PrL), anterior cingulate (Cg1-2), medial orbital (MO) and infralimbic (IL) areas. Discrete fibers terminate within the orbital areas VO/LO and the claustrum (CL). At bregma level, efferents distribute from area Cg1 medially to the somatosensory cortex laterally. Labeling extends throughout layers 2-3 and 5-6 in motor (Fr2) and sensorimotor (HL) areas, but remains in lamina 6b at the barrel field (BF) level. At the transplant level and beyond, labeling from the GFP donor tissue fills the host ipsilateral cortex from the retrosplenial granular area to the lateral entorhinal region. Efferents in V2L and Te1-2 areas are especially dense in layers 1-3, 5a and 6. Further caudally, labeled fibers occupy predominantly the cortical layers 5-6 as well as the PrS/PaS hippocampic regions. Finally, afferents with terminal-like profiles are systematically present in the dorsomedial sector (as well as along the lateral rim) of the striatum and into the basolateral and central amygdaloid nuclei (Fig 23). All these structures, including the cortical areas listed above, are normal targets of the rodent visual cortex (see Fig. 2). Though always disrupted by surgery (Fig 19, 27), the white matter (external capsule and corpus callosum) never appears to provide an attractive substrate for graft efferents. 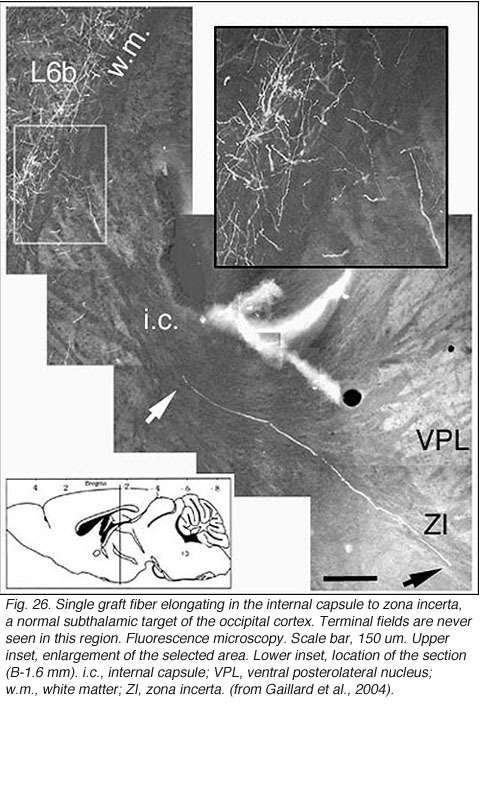 Even at the exit point from the graft, outgrowing fibers always appear to prefer elongating through the deep gray matter (layer 6) of the cortex, the major pathway for long distance intrahemispheric corticocortical axons in rodents (Vandevelde et al., 1996). Very few fibers can therefore extend to subcortical visual targets and the opposite hemisphere. Terminal-like arrangements can nevertheless be detected in the dorsal visual thalamus (Rt, LP/LD, DLG, Po), the pretectum (APT), SC and even in the lateral division of the pontine nuclei (Pn; Fig. 22); the ultimate target of the rodent visual cortex (Wiesendanger and Wiesendanger, 1982). Besides the unequivocal demonstration that developing and regenerating fetal allograft neurons possess a strong capacity for extending axons over considerable distance in the mature host brain parenchyma, the results deserve further comments. Firstly, allowing a delay between tissue sampling and implantation is clearly not necessary for outgrowth. Using a similar surgical protocol, extensive outgrowth can be achieved with cortical frontal and substantia nigra tissue grafts (Gaillard et al., 2004; Roger and Gaillard, 2004). For instance, eleven days after grafting, frontal graft growth-cone-like figures end up in the cerebral peduncle. Secondly, the massive fiber outgrowth taking place along the graft-host parenchyma interface argues against the current suggestion that lesion-induced glial scar formation and local overexpression of repulsive molecules (Fournier and Strittmatter, 2001) impede neurite growth in vivo. Thirdly, most outgrowing axons follow a normal route in the brain parenchyma and terminate in normal target fields indicating that cues for correct axonal guidance are readily present in the mature brain (Isacson and Deacon, 1996, 1997). However, some outgrowing axons spread into inappropriate targets. Fibers and terminal fields have been detected at considerable distance from the graft locus in the acumbens area; olfactory peduncle; tenia tecta and PBg nucleus, raising again the question of the specificity of innervation (see section 2.4 from the previous chapter). Non-targeted-directed elongation in the mature brain has already been reported for olfactory bulb neurons transplanted ectopically into the frontal cortex (Fujii, 1991). 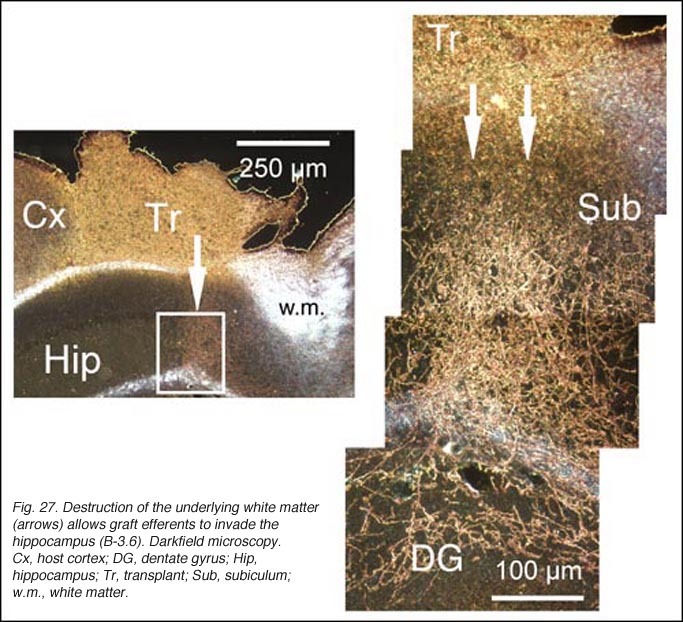 Fourth and finally, adult white matter appears to be an insurmountable obstacle for most developing axons in view that graft fibers grow clearly less through white matter tracts than through infragranular cortical gray layers. In addition, accidental removal of the white matter during surgery allows graft efferents to invade the underlying hippocampic structures (neuropil layers, dentate gyrus and subiculum). Neurite growth inhibition by myelin is currently (but not exclusively; Raisman, 2004) explained by interactions between myelin-related inhibitory factors (Nogo-A protein; myelin-associated glycoprotein, MAG; and oligodendrocytes-myelin glycoprotein, OMgp) and a common neuronal Nogo receptor (Fournier et al., 2001; McGee and Strittmatter, 2003; Filbin, 2004). Whether such inhibitory interactions make for graft axon repulsion in graft situations is debatable, in part because the neuronal Nogo receptor seems barely detectable in the normal brain at least till the end of the first postnatal week (Wang et al., 2002). The implication is that graft axons would be able to navigate for some two weeks in white matter tracts before being stopped by inhibitory ligands. This is clearly not what we saw. Only a few behavioral studies have investigated whether fetal tectal or occipital grafts can mediate recovery of impaired visual function in adult rats. Results are inconsistent. Stein et al. (1985) transplanted frontal and occipital E18-19 tissue blocks into bilateral aspirated occipital cortices and then trained subjects (albino rats) on both a brightness (neutral-grey levels) and a pattern (oblique stripes) discrimination task. Rats with frontal tissue grafts can learn the brightness task more rapidly and more accurately than animals with lesions alone. Occipital tissue grafts are inefficient. None of the grafted subjects can solve the pattern discrimination problem. In no case can graft efferents be clearly identified following HRP tracing methods. In a later work, Stein and Mufson (1987) obtained equally good results in both types of transplants in solving both tasks after pretreatment of the recipients (pigmented rats) with cyclosporin A. How these experimental modifications might affect the performance of rats having occipital tissue grafts is not discussed in this study. The puzzling effect of the frontal grafts is attributed to the release of specific (but unknown) recovery-promoting factors able to spare some residual visual circuits in the host brain. Some studies emphasize, however, that sparing of function is possible only with homotopic grafts (Barth and Stanfield, 1994), and that heterotopic transplants cannot form viable synapses with the host tissue (Zhou et al., 1998). Clearly the behavioral performance of adult subjects with occipital grafts needs closer examination. Filbin MT. Myelin-associated inhibitors of axonal regeneration in the mammalian CNS. Nat Rev Neurosci. 2004;4:1–11. 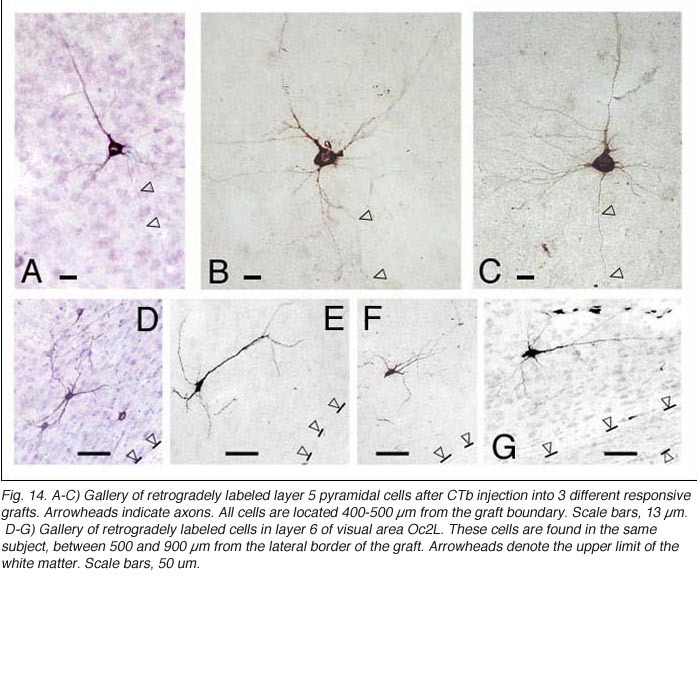 Gaillard A., Roger M., Senee A., Jaber M. Intranigral transplantation of embryonic mesencephalic cells in an animal model of Parkinson’s disease restores dopaminergic innervation to the striatum. FENS Abstr. 2004;2:A214.5. Harvey AR. Transplantation of fetal tectum into young rats. Neurosci Lett Suppl. 1984;15:S35. Kawaguchi S, Iwashita Y, Murata M. Neural repairing of the point-to-point projections in the mammalian nervous system Biomed Res 1994. 15 Suppl. 1 127–134.134. Lashley KS. The mechanisms of vision. VII. The projection of the retina upon the primary optic centers in the rat. J Comp Neurol. 1934;59:341–373. Lashley KS. The mechanisms of vision. VIII. The projection of the retina upon the cerebral cortex of the rat. J Comp Neurol. 1934;60:57–79. Lund RD, Development and plasticity of the brain: an introduction. New York: Oxford University Press. 1978. Paxinos G, Watson C. The rat brain in stereotaxic coordinates. Sydney: Academic Press. 1986. Paxinos G, Franklin KBJ. The mouse brain in stereotaxic coordinates. 2nd ed. San Diego: Academic Press. 1997. Roger M., Gaillard A. Upon transplantation, embryonic cortex neurons extend axons over long distance within the damaged adult brain. FENS Abstr.2004;2:A147.14. Sefton AJ, Dreher B. Visual system. In: G. Paxinos, editor. The rat nervous system 2nd ed. Sydney: Academic Press; 1995. p. 833-898. Sefton AJ, Dreher B, Harvey AR. Visual system. In: G. Paxinos, editor.The rat nervous system. A handbook for neuroscientists. 3rd ed. Sydney: Academic Press; 2004. p. 1083-1165. Stein DG, Glasier MM. Some practical and theoretical issues concerning fetal brain tissue grafts as therapy for brain dysfunctions. Behav Brain Sci. 1995;18:36–45. Tan MML, Harvey AR. The development and distribution of alpha-bungarotoxin binding sites in rat tectal transplants. Brain Res Dev Brain Res. 1987;36:293–298. Zihl J. Localised CNS lesions and their effect on visual function. 2000. Zilles K, Wree A. Cortex: areal and laminar structure. In: Paxinos G, editor. The rat nervous system. 2nd ed., Academic Press, Sydney; 1995. p. 649-685. The authorsDr Frederic Gaillard was born in Tours, France. He attended the University of Poitiers where he received his B.Sc. (1969) and his M.Sc. (1971) in physiology. He then obtained a Ph.D. (1975) and a Doctorat-es-Sciences (1984) in neurophysiology. Until recently, most of his studies focused on aspects of binocular information processing in the amphibian visual system, mainly on the functional properties of the crossed isthmo-tectal pathway. He is now examining host-graft relationships in the adult mammalian visual system. Since 1977, Dr Gaillard has been a senior investigator (Charge de recherches) of the Centre National de la Recherche Scientifique (CNRS) at the Institut de Physiologie et Biologie Cellulaires (UMR 6187). Poitiers, France. The authorsDr. Yves Sauve was born in Montreal, Canada. He attended the University of Montreal where he received his B.Sc. in Biochemistry in 1983 and his M.Sc. in Neuroscience in 1988 with Dr. Thomas Reader, focusing on the neurochemistry of catecholamines and their receptors in the CNS. 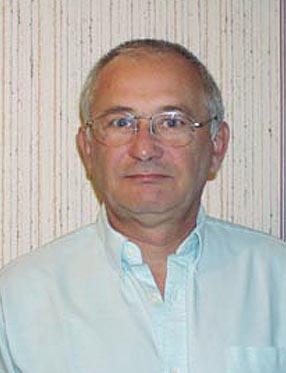 He then obtained his Ph.D. in Physiology under Dr Michael Rasminsky at McGill University in 1995 where his research focused on the electrophysiological evaluation of reformed synapses between regenerating RGC axons and neurons in the superior colliculus, using the preparation developed in Dr Albert Aguayo’s group. Dr. Sauve subsequently undertook postdoctoral studies with Dr. Raymond Lund at the Institute of Ophthalmology (University College London) where he developed electrophysiological approaches to evaluate visual responsiveness in rodent models of retinal degeneration. In 2001, he became assistant professor of Ophthalmology and Visual Sciences at the Moran Eye Center (University of Utah). 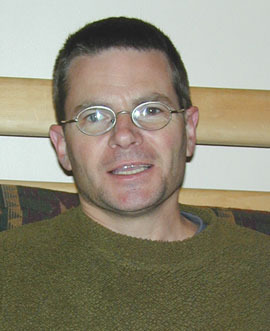 Yves has since moved to Canada and is now Assistant Professor of Ophthalmology and Physiology, University of Alberta, Edmonton. He is currently evaluating rod and cone function following retinal degeneration, transplant therapies, and regeneration in the adult mammalian visual pathways.